My son. Eli Stone Swanson. 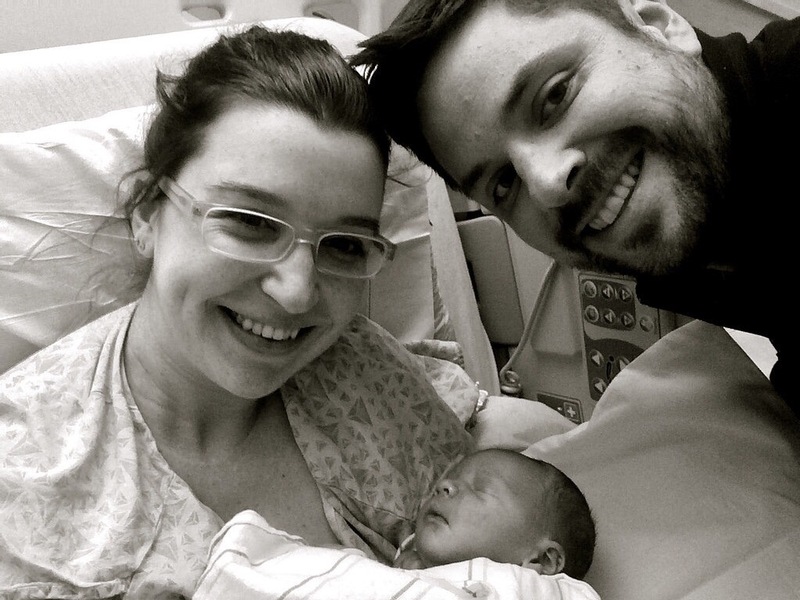 He came into the world last Tuesday, December 23, 2014 at 11:22am. A week and one day past due, Jared and I couldn’t wait any longer and with the advice of our midwife, scheduled induction for Monday the 22nd. We arrived at Mount Auburn Hospital in Cambridge full of nerves and excitement at 8am. The staff greeted us with smiles and holiday cheer and showed us to our room where we’d meet our little man. Our nurse Sue was a pro and I felt instantly in good, sweet hands. Mount Auburn is a lovely hospital and our room was spacious with a view of the Charles River and neighboring Boston skyline. I was given my first dose to jump start labor right away but in the coming hours, there was not much action. Jared and I talked, listened to music, took our last selfie as a family of two, and eventually I was given dose number two that afternoon. And boy did that work. As the sun set, the rain began to come down, and my contractions began to feel like hell. I’d grip my bed sheets as the lower half of my body tried to separate itself from the upper- or so it felt. Suddenly all the positions I’d practiced with Jared went out the window. The birthing ball sucked, standing and holding on to Jared was agony, the tub seemed out of the frigging question! All I could do was hold on like I was revving a motorcycle, close my eyes, and breathe through the pain. Jared talked me in and out of each contraction, watching the monitor like a hawk. He was amazing. A shift change brought me a new nurse and midwife whom I begged for drugs. Luckily my dilation was moving right along, Eli was looking strong, and in the IV went with instant narcotics. I can’t say it made the contractions any easier but at least I passed out between each. Honestly, it was next to impossible to keep my eyes open. Around 3am I was progressing well and ready (oh so so so ready) for my epidural. Jared was asked to leave the room and I was left with an anesthesiology team and my night nurse Nicole. I could have made out with Nicole I loved her so much at that moment. 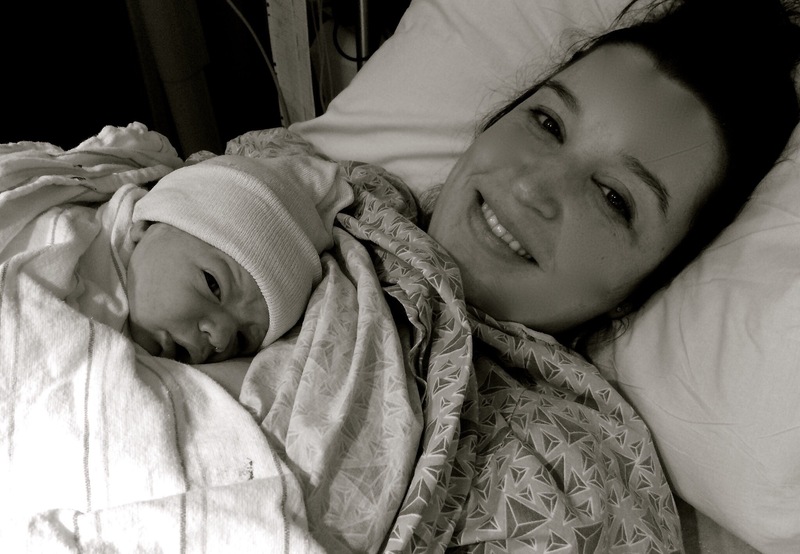 She held my hands and I practically burrowed my head into her chest, breathing through each contraction, terrified to move as the anesthesiologist worked his magic on my back. Still loopy from the narcotic, I don’t remember much from the next few hours other than sleeping and the midwife and nurses flipping me from side to side to make sure Eli was happy. By morning, my sweet nurse Sue returned. She brought along a young nurse Jackie and a fabulous midwife named Hannah. I told the women I kept feeling the need to push and all were excited. One dose of Pitocin to finish up the process and they agreed around 10am that I was ready. They kept me on my right side and surrounded my bed with Hannah sitting at the end of the bed so casually I kept thinking, is this really it? We’re going to deliver this baby right here and now like I just woke up from a slumber party? 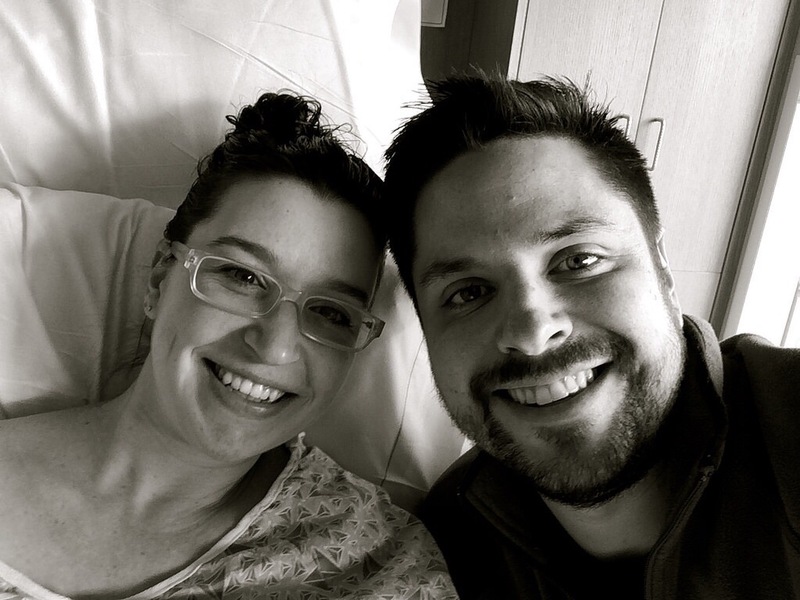 With the next contraction, Jared lifted my left leg and my team of four cheered me on. Jared was supportive as ever telling me what a great job I was doing. My midwife said I was a naturally great pusher- can I put that on my resume? Nurse Sue instructed the perfect positioning while Jackie counted me through each push. Honestly, the pushing felt great and went by so unbelievably fast. 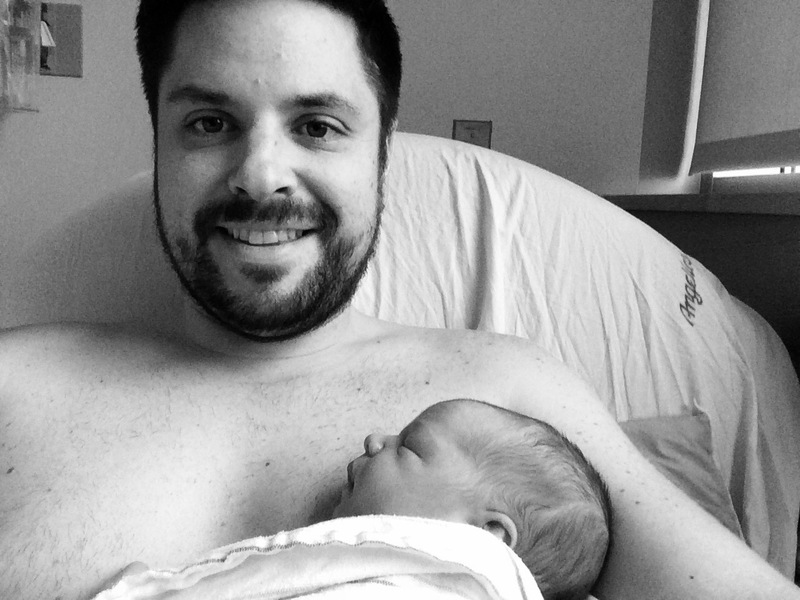 Once Eli’s head was out, they flipped me to my back and with just one or two more big pushes, I felt my sweet boy slide out and into the world. With only a few little sounds and sobs, Eli made such a calm and peaceful entrance. Hannah immediately handed him to me and I felt his slimy, perfect bum in my hand. 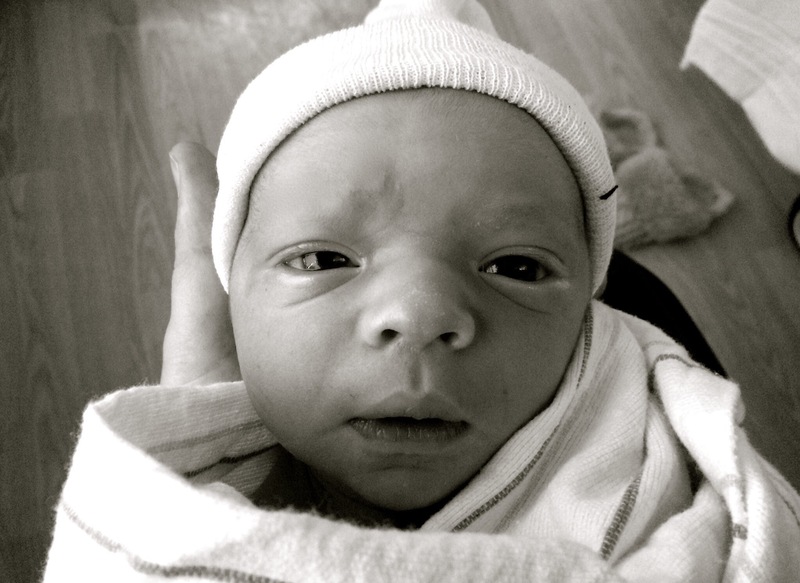 He looked right at Jared and me as we spoke and introduced ourselves to our small miracle. I had been dreaming of his face and just knew he’d have all that dark hair just like his Daddy. After plenty of staring into Eli’s dark blue eyes, the umbilical cord was finally cut and my small boy was no longer a physical part of me. Hannah took care of the after birth while Jared and the nurses took Eli to the scale in our room. 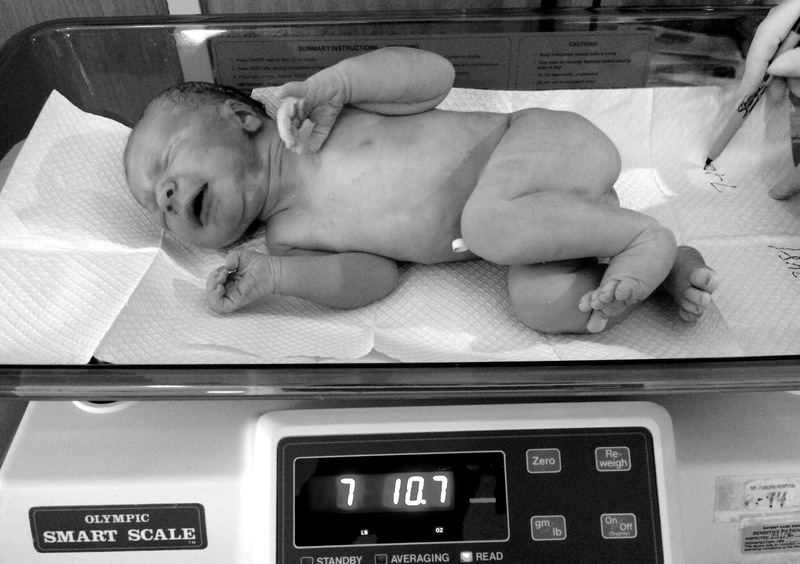 He weighed in at 7 pounds and 10 ounces. He measured 21 inches long. I had no idea there could be this much room in my heart for so much love. Not only for my son but a new kind of love for his Daddy. Our family is so different now. Overwhelmingly so at times but we’re getting the hang of things together. Very much together. Which makes me even more grateful for our family. Team Swanson has a new game plan with a new player and this Momma could not be happier to play the game. You are now 4 days late which for some reason shocks your Momma even though I know that most first babies arrive past their due dates. I assumed you’d be just as anxious to meet us as we are to meet you. But I know that you are very comfy and warm in your little tummy apartment and it may take a couple more days for you to come out and play. Your Momma and Dad have been getting all sorts of notes from family and friends asking if you’ve arrived yet. We feel very very loved and you should too! So many people want to meet you. You are one popular little guy. Christmas is just around the corner and Momma gets all silly and teary-eyed thinking about a quiet, cozy Christmas with our new family of three. You see, this whole year if I had a day where I didn’t feel my best- maybe it was a stressful day at work or maybe you were growing so much you tuckered Momma right out from doing anything productive. When I would feel down, all I had to do was picture me and Dad holding you in our warm living room by the Christmas tree and everything seemed so incredibly worth it. I hope you see the beauty in small things. I hope you can confront any challenge with a deep breath. Be patient. Try to find the good in any situation. Never suppress a generous thought. Cherish and respect the people that come into your life as you never know for how long you’ll have them. Learn from your mistakes and don’t regret them. Treat your body well. I hope you are never embarrassed to feel, cry, laugh, sing, dance, or love. Even if you stand alone, stand tall in making the right choices. Do what you love and do it wholeheartedly. Find joy in the journey. And enjoy. Enjoy it all.